Marvel recently announced She-Hulk will get her fourth attempt at an ongoing series. It might be interesting to look back at Shulkie's humble beginnings in the decade that defined her. The emerald beauty had her first shot at a solo book back in late 1979. 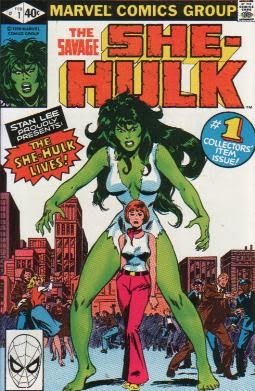 Cover dated February 1980, Savage She-Hulk #1 hit the stands with a story by none other than Stan Lee. As most premiere issues are wont to do, it set up She-Hulk's status quo and told her origin story. In a nutshell: She-Hulk is Bruce Banner's lawyer cousin Jennifer Walters who was injured by some mobsters she was trying to get convicted. Her visiting cousin Bruce is forced to save her life by giving her a transfusion of his own gamma ray tainted blood which transforms tiny Jennifer into the She-Hulk. Now, don't let the word 'savage' fool you, She-Hulk was decidedly more level headed and intelligent than the Hulk, which unfortunately meant she was also decidedly less powerful than him. Where the Hulk's rage fueled and increased his strength to potentially unlimited levels, the less angry She-Hulk could lift a car... on a good day. She-Hulk was the last major Marvel character Lee created. A bit of a dubious honor, considering She-Hulk, not unlike Spider-Woman and Ms. Marvel, only saw the light of day because Marvel wanted to trademark the female counterparts of their biggest heroes before their distinguised competion could. Still, the Stan Lee penned debut issue garnered generally favorable reviews. That all changed with issue two. Lee was only brought in to do the first issue, it was up to David Anthony Kraft to chronicle the jade giantess' adventures on a permanent basis. And so he did, for 24 more, increasingly mediocre issues. Kraft's She-Hulk wandered around aimlessly, running into trouble along the way, much like her infamous cousin did on his then popular weekly TV show. And if you thought her friends and allies weren't all that, let's consider her villains... The biggest threat she faced was indecent exposure from her skimpy, ripped outfit. Other than that, she spent the first 8 issues trying to prove She-Hulk wasn't a menace or a killer. Long, tedious issues saw Shulkie angsting over the fact the public thought she had killed Jennifer Walters because she was reported missing pretty soon after She-Hulk's first appearance. Add to that a mobster with high tech gadgets called Nick Trask and some creepy paternal swamp demons from a 1974 issue of Man-Thing. The non super powered orator called The Word and his semi-strong daughter Ultima rounded out Shulkies first year rogues' galery. The year ended with She-Hulk on her death bed after contracting a rare blood disease only Morbius the living vampire could cure. Savage She-Hulk's second year was slightly better villain wise... if only because it had some actual superpowered baddies. She started out fighting Gemini, one (or two?) of the android Zodiac, then she got involved with the Man-Wolf, Hellcat and the secrets of the mysterious teleporting shadow cloak in a two part tale too inconsequential and convoluted to get into. And the best of the worst was yet to come! 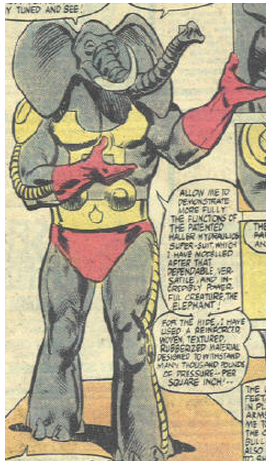 Issue # 17 saw the debut of the much mocked Man Elephant. Industrialist Manfred Haller designed a durable, hydraulics powered suit that granted its wearer superhuman strength and durability. 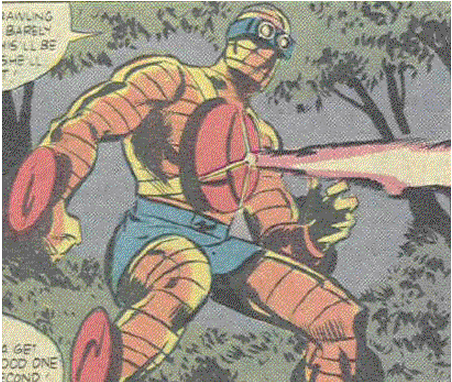 This (of course) led him to a direct confrontation with the She-Hulk who proved no match for Haller and his suit. The moment he realised Shulkie was actually one of the good guys, Haller backed off and that was that. Dan Slott would reinvent Haller years later, turning him into the even more formidable Behemoth, with a far more threatening look than Haller sported in his original appearance. 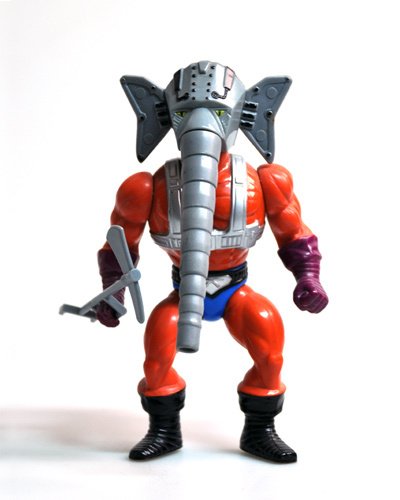 After surviving the Man-Elephant, She-Hulk savagely sat through villains like the Grappler (one of Scourge's victims that never returned) and Ralphie Hutchins, a boy whose adaptable powers allowed him to shift through a variety of villainous identities... From the Brute, to the Seeker to Radius, Torque and finally the Earth-Lord... None of them worth getting into. In the closing pages of # 25, the She-Hulk felt the earth move under her feet... And not because she was finishing up her fight against Earth-Lord, her book was stumbling towards cancellation as well. Poor sales, lackluster villains and a general sense of apathy and lack of direction were to blame. She-Hulk was resigned to comics limbo after her final issue hit the stands on February of 1982. But her luck was about to change... Then-Marvel editor in chief and Avengers writer Jim Shooter took a liking to little ol' Jennifer Walters, which meant she was back in rotation by July of that same year. After a series of rather unfortunate events, from Yellowjacket beating the Wasp and getting expelled to Tigra chickening out, the Avengers were looking for a few good men (and women!) to bolster their ranks. Thirty plus years ago, way before everyone and their uncle became card carrying members of Earth's mightiest, the notion of a new hero joining the team was something to be genuinely excited about. Jim Shooter's take on the character was a whole lot less savage. His She-Hulk was fully dressed, for instance. However, Jennifer still had the same lousy luck with villains. After enjoying half a dozen helpings of eggs benedict, She-Hulk joined the other women in fighting wannabe super villain Fabian Stankowicz and his massive Mechano-Marauder battle tank. After dealing with him, She-Hulk accepted the Wasp's offer to join the Avengers. On April 8, 1982 president Ronald Reagan signed paperwork admitting She-Hulk into the ranks of Earth's mightiest heroes. Unbeknownst to both of them, She-Hulk joined at the same time the rebellious longtime member Hawkeye (Clint Barton) returned to active duty. Their outspoken personalities clashed before they were even officially introduced. 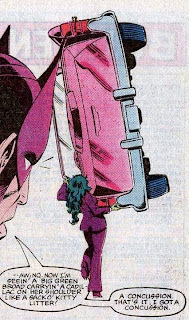 On the way to Avengers Mansion, Shulkie cut him off in traffic in her trademark pink cadillac, prompting the archer to secretly fire a trick arrow that shortcircuited the car's electronics, forcing She-Hulk to take matters into her own hands... literally. "Now I'm seein' a big green broad carryin' a Cadillac on her shoulder like a sack o' kitty litter!" 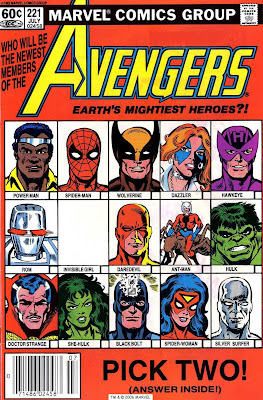 Hawkeye found out he wasn't dreaming when he made his way to Avengers mansion and discovered Jennifer Walters was in fact the second new member of the team. Apparently, one can beat Manhattan traffic quicker and easier carrying your car than by sitting in it. Also: this is the first and only documented time the She-Hulk was seen smoking. "Something tells me this could get interesting..."
She-Hulk's stay in the Avengers, her Byrne solo-series, and her stay in the FF (also by Byrne) were all really fun reads if I recall correctly. Actually, I remember wishing that she could have stayed on "permanently" in the Avengers or the FF, but that just couldn't be, I guess. I just started getting into comics around the time Savage She-Hulk was in print, so I never actually read it back in the day. After later enjoying Byrne's take on her in her own series, I bought the Essential compilation and had trouble motivating myself to read the whole thing. Glad to know it wasn't just me.